Gangland Undercover is back. Recently, A&E announced season two of the series will launch in December. Season two of Gangland Undercover debuts on December 8th at 10 p.m. ET/PT. New York, NY – November 18, 2016 – A&E Network will premiere season two of the intense scripted series “Gangland Undercover” inspired by Charles Falco’s 2013 memoir, Vagos, Mongols, and Outlaws: My Infiltration of America’s Deadliest Biker Gangs on Thursday, December 8 at 10PM ET/PT for an eight episode run. The drama series recounts the personal story of Charles Falco, the most famous informant you’ve never heard of and his mission to infiltrate three of the world’s most notorious biker gangs. Season two introduces a slate of new and recurring characters. Damon Runyan returns as Falco, and is joined by Thomas Mitchell as Bullet (RED, Murdoch Mysteries), Hannah Anderson as Sarah Jane (Shoot the Messenger, Lost Girl), Stephen Eric McIntyre as The Devil (High Life, The Lookout), Shaun Benson as Crowbar (Channel Zero, Saving Hope), and Joanne Boland as Meredith (Train 48, Deadliest Sea), while Ian Matthews (Lost Girl, A History of Violence) returns as Darko, along with Ari Cohen as Koz (Small Town Murder Songs, Maps to the Stars). The new season of “Gangland Undercover” joins Falco trying to adjust to a strange new life in Witness Protection. But fueled by a restless unease and an inability to embrace his new world, Falco takes the chance to return to undercover work. He joins ranks with Bullet, a relentless undercover agent with a personal grudge against biker clubs, and together, they recruit a team of informants to infiltrate not just the Mongols, but also their notoriously violent rivals: the Outlaws. Before long, Falco finds himself in over his head and thrust on to the front line of a territorial biker war between multiple clubs. While Falco’s undercover life grows increasingly dangerous, he simultaneously gets drawn into a passionate relationship with a sparky waitress named Sarah Jane. Trying to balance his personal and professional life proves increasingly complicated, and soon Sarah Jane finds herself hopelessly entangled in Falco’s dark and dangerous world. Alongside action-fueled scenes, season two explores the characters’ inner turmoil, as viewers discover the mental and physical toll the mission takes on Falco and his assembled team of confidential informants. 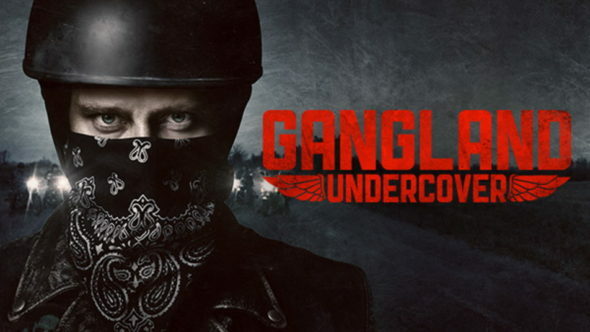 From misjudged drug deals to polygraph exams at gunpoint, viewers will be taken on an emotional rollercoaster as they experience what it’s like to go undercover in one of America’s most dangerous crime underworlds. Season one of “Gangland Undercover” aired last year on HISTORY and followed Falco’s three-year mission living a double-life as an ATF informant planted inside one of the most historically dangerous motorcycle gangs, the California-based Vagos – a group involved in drug trafficking, arms smuggling, money laundering and murder. Falco initially took on the assignment to avoid 20 years in prison on drug charges, but his outlook soon shifted, becoming a quest to achieve justice. Operation 22 Green, as it was known, ended in March 2006 with the arrests of 25 gang members. The new season’s opening theme song, We Will Not Go Quietly, is written and performed by Sixx:A.M. The song is featured on the band’s album, Vol. 2, Prayers For The Blessed. The theme song is available to stream and purchase digitally and can be viewed as a music video, directed by well-known video director, Wayne Isham HERE. Comprised of rock luminaries, Nikki Sixx, Dj Ashba, and James Michael, Sixx:A.M. are currently touring across the U.S. in support of their new album. What do you think? Have you seen Gangland Undercover? Will you watch season two? More about: A&E TV shows: canceled or renewed?, Gangland Undercover, Gangland Undercover: canceled or renewed? Watched Season two,…..loved it, now have to rent Season one at the library….Hope there will be a Season three! love the show. have a hard time findig it. had marathon on hictory channel 5-21. what channel will it be on and when? Simple A&E, is the show dead or not, have the guts to post if it’s cancelled. season 3 gangland undercover should not even be a question about renewing the show. just do it there is no risk left to question its got the publics attention and you will run more viewers off by doing this every season than if you just go ahead with season 3 stop the anticipation garbage put it back on where it belongs . still waiting for the network to quit playing with the renewal of this show put it back on already. enough is enough don’t ask again just run the show my TV is going to wear out before you guys get the hint great show. great show real life based shows are the best but many don’t even compare to the down to earth reality that gives you a look into something you may have wondered about but never new the reality of.